Hello, my name is Ali Van Slyke and I’m so happy to be a part of the Music and Arts team! I️ grew up in a musical family and started taking piano lessons at 5! I️ quickly moved to guitar and drums but decided to stick with saxophone as my main instrument starting in 6th grade. I attended Creekland Middle and Collins Hill High School and was a part of the wind ensembles, jazz bands, and marching band. I️ studied saxophone through college at Kennesaw State University and am currently studying business. Music is so important to me and I️ always love sharing my passion with other people who are interested in music! Anyone can learn at any age so it’s never too late! 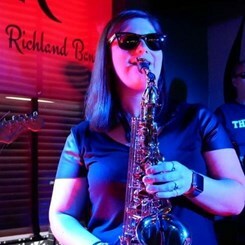 I️ currently play in a classic rock band (The Richland Band) in the John’s Creek/Suwanee area! Feel free to ask me any questions or stop on by the store. I️ love to stay updated with new gear so let’s chat!